BN P & S manufactures and distributes globally the Bio-Nobile brand manual and automated solutions for nucleic acid (genomic DNA, plant DNA, total RNA, mRNA), and also reagents for cell and protein purification. 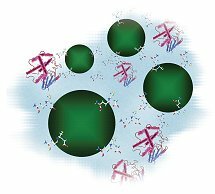 The QuickPick™ SML (Small-Medium-Large - scalable for various sample sizes) DNA purification kits provide a fast and simple means of purifying DNA from a variety of samples. The technique does not require any organic solvents and eliminates the need for repeated centrifugation, vacuum filtration or column separation. BN P & S also provides various purification and isolation services. Read more about it on the Services page. The QuickPick SML Plant DNA purification kit provides a means of purifying genomic DNA from a variety of plants or their organelles. The kit generates high-quality DNA from different plant species. It is possible to scale the kit up-and-down for variuos sample amounts by using different kit reagent volumes. The QuickPickTM SML genomict DNA kit, combined with lysozyme treatment, generates high-quality genomic DNA from gram-positive Lactobacillus Sp. Purified DNA can be used directly as template for PCR amplification. Feathers are a difficult material to isolate DNA from, since only the feather tip contains the DNA. Attached to the outside are old skin cells, while inside are old blood cells, from when the feather was still growing. However, feathers offer advantages compared to blood samples because they can be collected much earlier from young chicks and DNA analysis can be performed at a very early stage.